In the US, we know November 11th as Veterans Day — a time we take to honor the men and women who have served in the U.S military. 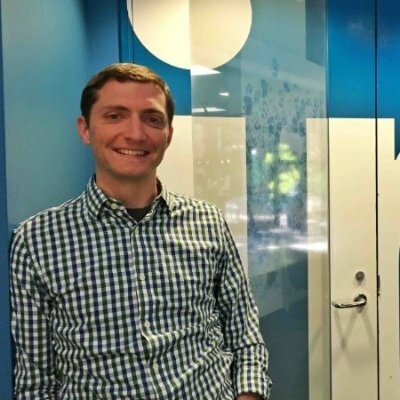 But rather than solely focusing on veterans’ past, at LinkedIn this year we’re bringing focus to the skills and characteristics that veterans bring to the workforce. Instead of simply honoring them for their accomplishments in uniform, we’re honoring veterans for all they have yet to achieve. A common challenge for transitioning veterans is overcoming misperceptions and misunderstandings about what we bring to the workforce. As a former infantry officer, it’s not exactly obvious how I might have ended up working at a tech giant like LinkedIn, but my military experience conferred upon me a broad set of skills and experiences that ran much deeper than simply leading men in combat. In fact, the business case for hiring veterans has been thoroughly researched. Like me, the military and veteran members on LinkedIn have had to demonstrate fluency in problem solving, strategic planning, flexibility, entrepreneurial thinking, team formation and leadership, and attention to detail, among scores of other highly valued skills. But given society’s general lack of familiarity with military roles and responsibilities, it may not be clear to those not closely tied to this culture how well military skills translate into skills needed in civilian jobs. In fact, explaining this to recruiters and hiring managers is a common challenge facing transitioning veterans. So to better understand the type of skills veterans develop during military service and how those skills can be useful at the workplace, our research team analyzed the profiles of 1.1M Veterans on LinkedIn who have completed their service and are currently employed in non-military occupations. 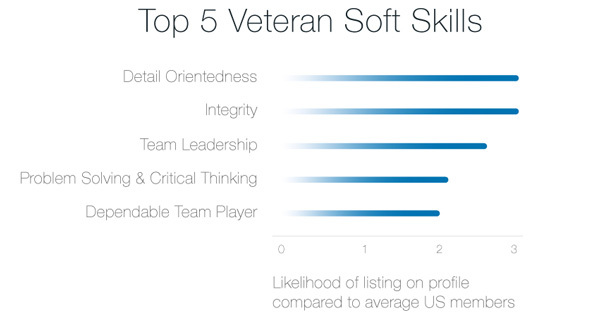 We then isolated the skills that veterans are more likely to have, compared to all U.S. LinkedIn members. While these are not the skills you typically see explicitly listed in a job posting, these soft skills are often viewed as the most valuable by hiring managers. In fact, a recent LinkedIn survey of hiring managers shows that the most in-demand skills are in fact a candidate's’ soft skills rather than their business or technical skills. And, 59% of hiring managers surveyed believe soft skills are hard to find. But don’t just take the data’s word for it. Veterans are highly recommended professionals. To date, they have received over one million recommendations for their work on LinkedIn. While we’ve pulled excerpts from recommendations of real LinkedIn veteran users with these skills, the words ring so familiar. Each of these recommendations could be describing any one of the men and women I served alongside. It’s probably no surprise that veterans excel in the areas of detail orientedness, integrity, team leadership, problem solving, and dependable team player as these were all key skills we had to practice every day in the military. But when looking at a veteran’s resume, the transferrable skills might not always be as obvious. By looking at the soft skills veterans excel at, our team also highlighted the job occupations demanding these specific skills to be successful. From entry level to more senior roles - data entry, to industrial designer to marketing product manager, there is a diverse set of occupations that are looking for these valuable skills that veterans already have. So, the next time you encounter a veteran candidate, I urge you think about the transferable soft skills the candidate could bring to an otherwise unrelated job. And if you’re a veteran, keep this skills in mind during your job search. The contributions veterans can bring to an organization are immense. In addition, If you’re a recruiter and want a reliable way to screen candidates for soft skills, download the Guide to Screening Candidates: 30 Essential Behavioral Interview Questions. Check back next week for our upcoming posts on the business skills veterans are excelling in over the average LinkedIn member.